The House was called to order at 7 o’clock, Pres. Wilson in the chair, & proceeded to the regular order of business. Under the head of nomination & election of members, Mr. Garrison was nominated & elected, but not being present was not duly initiated. The President gave notice that at the next meeting an election of officers for the ensuing term would be held.The Question for debate was then read & discussed on the Aff. by Messrs. Swearinger & Gaines and on the Neg. by Messrs. Kent & Horner. 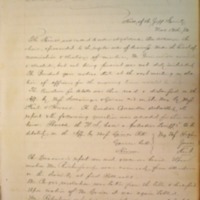 The Question Committee submitted its report & the following question was selected for three weeks hence: “Should the U. S. have a protective tariff?” To be debated on the Aff by Messrs. Gaines RH.Neg. Messrs. Hughes.Gaines. C.B. JamesHorner.Kent. University of Virginia. Jefferson Society, “Jefferson Literary and Debating Society Minute Book,” 1880 November 13, WWP17262, Jefferson Literary and Debating Society Records, Woodrow Wilson Presidential Library & Museum, Staunton, Virginia.